I've created a set of three handouts for Better Speech and Hearing Month. 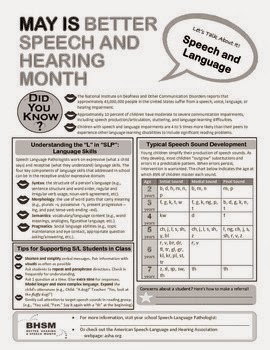 The handouts provide basic information and classroom tips for working with s/l students in the areas of (1) Articulation/Language Development, (2) Fluency, and (3) Vocal hygiene (geared towards teachers not students). My idea with these was to give one out each Monday during the month of May. It was a good idea until I got called away for jury duty! I ended up missing quite a bit of work and wasn't able to circulate them as planned. But the ones that I have handed out have been well received, so I'd like to share them with you! In honor of BSHM, please enjoy a free download of the handout covering language and articulation development. If you like it, download the rest from my TpT store!